This week, my students have been working on a site-specific production at our Newton Park campus and its beautiful and ‘stately’ Main House. Part of the production brief included lighting of the house exterior, projection, sound and temporary light and power for a marquee. Today, we’ll look at the economics of light, kit and current trends in the industry. Our original design specified powerful RGBW DMX controlled LEDs PARs (for outdoor use) that spanned a huge facade and ancillary buildings from end to end. This original spec we could imagine represented 100% “lighting value” in this case. Projection, sound and lighting control systems were already available to us, so these were ‘free’ at this point. We do the labour, so we budget to hire the rest of the kit. Despite good quotes from different suppliers, we still had to make savings on our part of the budget for other stuff in the show. Not unusual. We made cuts, reduced the creative capabilities of the system and came to a compromise that let’s say resulted in 65% “lighting value” in comparison to the initial spec. Still good, still fine for the show, still plenty workable but 60% of the original in lighting terms. Did we reduce the exterior lighting bill by 65%? Of course not. We probably took 30% off the initial costings, enough for Production to allocate the cash to other places. I’m not going to suggest that this is the 80/20 principle in action directly here but it isn’t surprising that to save 30% you have to cut your ‘lighting value’ by a lot more. We cut costs by 30%, but reduced our visible value by to 60%. Why is that? If we skip past the simple fact that the cost of trucking etc. remains fairly static even when the equipment spec and cost can vary wildly, we can’t ignore the basic infrastructure needed to make any kit work. In a temporary system for a site-specific show, the cost of everything is right there on paper and not hidden in the walls and cupboards of a purpose built theatre. Every cable, every splitter, every bit of cable ramp or rigging widget. It’s all there, on the list, with a cost. 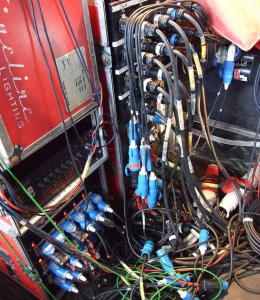 Complex and expensive lighting equipment racks up hire costs, but copper, rubber and polymers sit there keeping a lid on how much reduction in cost you get from taking away ‘lighting value’. Both cheap and expensive lighting devices need power, power needs to be distributed not to mention control. The cost of the copper. There is good news, though. On this particular show, the initial ideas looked at a common solution to temporary power and we costed a 60KVA generator including delivery and diesel. I’ve been doing outdoor shows for over 20 years and this kind of show would always have been a 60 or 100 KVA genset plus distro just to get the marquee and lighting systems running. The cost of the power generation alone would have been an additional 50% on top of the original budget, without even plugging a cable or single outdoor floodlight in. In recent years, the infrastructure requirement has been turned on its head through the use of ever-improving LED lighting fixtures. Power draws have reduced and this has taken the strain off the distribution such that we were able to do all of the exterior light and power safely with a few 13A feeds from the buildings and use the cash on visible light. The ‘look’ was big but the power requirement was small. The move to LED in all areas of production lighting continues. With other technological advances, this continues to allow us to do more with less. However, bear in mind that the cost of ‘stuff the audience doesn’t see’ often has a cost floor while keep trying to make sure that there are paying eyes on the bulk of the cash.